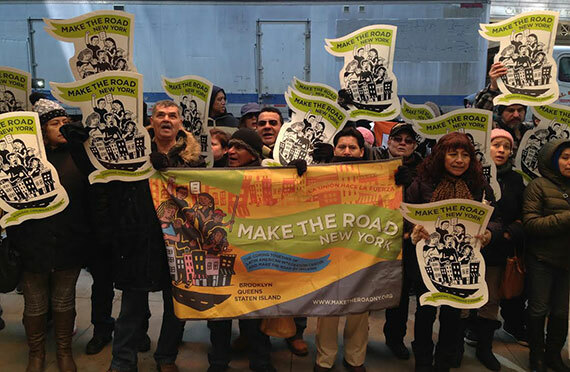 More than 80 tenant advocates descended on New York’s “Billionaires’ Row” Wednesday to protest against what they believe is an unfair tax break for the wealthy. The 421-a abatement program, which is set to expire in June, is meant to provide tax breaks for developers who provide affordable housing as part of their newly constructed buildings. 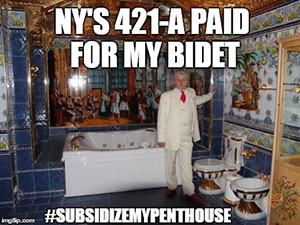 While Mayor Bill de Blasio — who is planning to build or preserve a total of 200,000 affordable units in the city over 10 years — has used the tax breaks as an incentive to get developers to create affordable housing, some luxury projects have received the abatement without including any affordable units on site. Extell Development’s One57, which is home to the city’s first $100 million closed apartment sale, for example, does not include any below-market rate units. 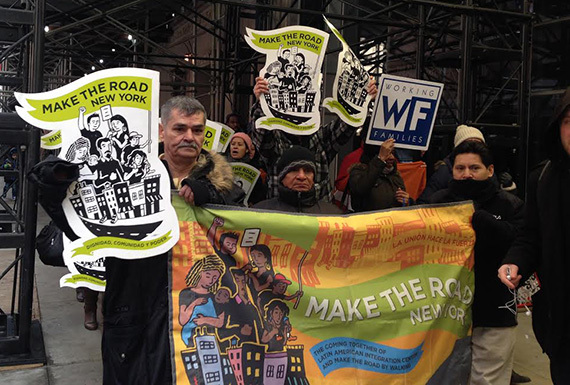 In front of One57 — where wealthy tourists staying at the Park Hyatt hotel walked in and out of the building to chants like “subsidize our house, not their penthouse.” — the advocates hoped to shed awareness on the issue and call out to lawmakers. 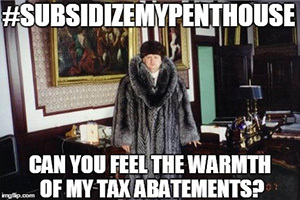 Protestors created posters with caricatures of billionaires posing under a #SubsidizeMyPenthouse sign. Longtime New Yorker Olive Freud attended the rally, fighting for not just the affordable housing cause but also to protest against tall towers that cast shadows over Central Park. Kerri White, a director at the Urban Homesteading Assistance Board, said that it was “insanity” that the 421-a program persisted in the middle of a housing crisis.She added that the state needs to be pressured to implement stronger rent laws. “Who are they trying to protect?” she asked. After protesting in front of One57, the group walked over to Columbus Circle, where the rally ended in front of the Related Cos.’ Time Warner Center, the building at the center of the New York Times’ investigation into wealthy foreign buyers . After about 45 minutes, the protesters folded up their signs and banners and dispersed, some disappearing into the subway, others walking back along the construction sites on Billionaires’ Row.